A few days before the new year, I decided that I wanted to start with a fresh look for the new year. And what better way to do that than to chop off a bunch of inches of my hair. Secretly, I want long hair, but it just doesn't seem to suit me. I had really, really long hard my freshman year of college and I cut 13+ inches off and never looked back. So many of you comment on my cuteness, which I am beyond flattered by. I got a little silly in this photo shoot and did a cheesy cute photo. And then cracked up about it. Secretly, I use that face when I really want something. Its my version of puppy eyes. looks fab! 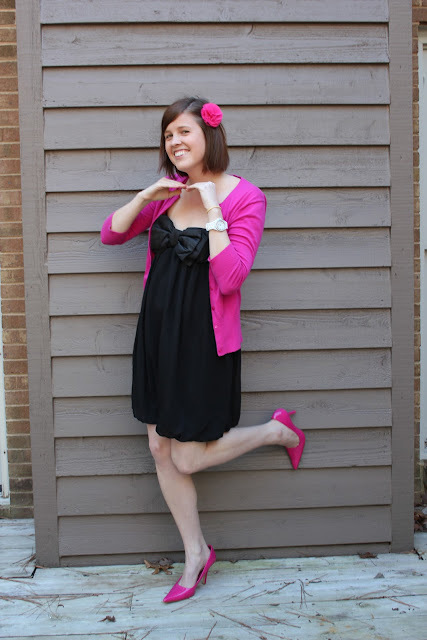 loving the pink pumps! so girly! Adorable and your hair cut is super cute!! absolutely love the hot pink and black!! we would love for you to link up with us on sunday "sunday best". we need some help with ideas on things to wear to church, so any skirts or dresses you would like to share with us would be great! hope to see you sunday! SUPER cute and sassy new hair cut! You are still adorable, but I love the new do! hair cut is fine but I generally fell long healthy hair is better for ladies.